Thank you for joining me, Halrath. I think this should be quite the momentous occasion. Before we begin, I, as much as others, would love to know more about you, what a Product Manager does – or in this case what your role for TERA Console is. A product manager handles a TON of stuff for a video game. I coordinate all the tasks with the different teams (community, art, operations, writing, QA), do a shocking amount of writing, generate projections of monthly performance, budgets, not to mention all the data entry for in-game events, products, and so forth. That’s awesome, so I recently did a video and before I continue, I apologize for sounding like I’m sick, because well, I am. But going back, I did a video asking the community to submit their questions and it took all day yesterday, but thanks to my lovely girlfriend, we were able to go through them all and filter the questions that we thought were probably most important. So, with that said and done, I’ll ask my own questions first. Knowing how PC TERA is, and trust me I can already see the gif that Bobcat made being thrown at me, it’s always tickled the line of Pay to Win. With the lack of items and materials that players need to actually progress in the game, and nothing really being done about that. Do you see TERA Console taking a different approach, and perhaps having those items more accessible rather than through the cash shop? I’m being vague, because I don’t want to name the items, but I think this makes sense. TERA has never crossed the line with pay to win. Not by a long shot. Our philosophy has always been pay for convenience, not victory. We also try to keep things balanced and accessible, and we always will. There’s a sense in the community that En Masse and Bluehole just doesn’t really care about TERA at all, that in fact TERA Console was ported over as a way to make a quick buck and then leave it for dead. Some of those concerns come from the fact that the Founder Packs took so long to be taken off the Playstation and Xbox Stores. Is there any reason for that, or rather, is there something you’d like to tell the community that is watching this for what’s happened? The port to console took over two years of work, so the idea that it was a way to make a quick buck is not accurate at all. As for the founders packs, it’s quite common for those to be available during a launch window, which is usually longer than two weeks. TERA PC is going on 6+ years of live service and we’re barely six months into our live service. “So long” is a subjective term. Alright, well let’s get off the hard questions for a bit. Deathwrack is coming, that is the hype of the game right now, and rightfully so. We know that Broken Prison was taken off, and now we have Velik’s Hold, Demokron Factory at 417 item level and The Abscess coming in. In the latest news post that, in fact you posted, you let it be known that there would be new dungeons monthly, and on Discord we knew that the Hard Mode versions of the dungeons would be coming mid month. How will that work coming up to Valkyrie, and are we able to know those dungeons now? So, my plan, which I hope players will find glorious and engaging, is to keep rolling out new content and events every couple of weeks. We all know the valkyrie is coming in January, but we’ve got a long way to go until then. Even after the valkyrie arrives, there’s still going to be more to do. I know our players had to endure a drought, which was unfortunate, but not something we were able to change. My plan now should keep people happy, engaged, and hungry for more. I think the majority of the community is excited about the content coming, but they’re more so wanting to get those bugs fixed and optimization added to the game. With issues on Playstation for example where it takes up to a minute delay when you go to the Playstation home screen to go back to the game itself, lag and server problems – what can we expect from En Masse or Bluehole to remedy this? We are all concerned about bugs and issues. Cobaltdragon and I bring things to Bluehole’s attention, push for resolution, and try to stay abreast of their work, but it’s never going to be easy because they are the developer and we’re the publisher. We have to let them do their work and give them the best information, the most details, so they can track down the root causes and fix them. Being more than 6 months now where it took so long to get content, will players be dealing with this type of delay in the future? Bloody hell, I hope not. One last thing from me, I know you guys couldn’t name the PVE Server Wonderholme, but there is one other suggestion I’ve had for a long while. In fact, Richard, who’s an avid player, an awesome guild member of mine and friend, and I have spoken in great lengths about this. Is there ever going to be a possibility of removing dungeon entries, even if its just for an event or perhaps permanently increasing the dungeon entries in general? Dungeon entry limits are part of the game designers’ efforts to control the economy. We are sensitive to making changes to it because things often spiral off in ways no one could imagine. We’ve done additional dungeon entry events in the past, and probably will in the future, but will probably never utterly remove them. Not for some time. We haven’t even gotten to the new gear system, and awakening came after that. If you so desire, yes. The rest of the questions I was going to ask are really just gender lock, now we know that Bluehole has been teasing the fact that they are willing to add all gender and race counterparts to the classes, do you have any idea if that would come to TERA in general? Let’s temper your expectations on this. Bluehole is adding gender/race combinations to TERA, but you might have noticed that it’s happening one at a time. (elin gunner, male brawler, etc.). It’s going to be a long time before everyone has everything. There won’t be a massive update and we suddenly have baraka reapers and amani valkyries. As we’ve already said, the warriors receive a big update to their skills and no longer share Edge. That’s all that we’ve said. On PC and console, the enchanting events only worked to +9, which is not much benefit to players. We try to keep our eye on things and help players where we see the need, but again, with the goal of not wrecking the server economy while we do it. Now, for the cosmetic part of this interview! Yes. Heck yes. Some of my favorite items are coming up in the Deathwrack update, and there’s going to be even more in the future. Well, the witch’s hat is available in the store now. The wacky quacky mounts are on my list for engagement events, so the answer is yes. You’ll eventually see them somewhere. Denis, you’ll have to wait for the patch notes, but my advice is get any dungeons in you want now because SOME of them are going away. We have requested this, so I know it’s on our list of stuff we’d like. I don’t have a timeline on when. Do you think it’s possible for En Masse or Bluehole to bring the ability to show how many hours someone has played in-game? This comes from Nekomi. There are lots of PC related questions to compare the game versions, so I will sum it all down and hope maybe you can answer these questions for the players. What PC features do you think we’ll see on Console? For example, we know that we’re going to be getting an LFG tool with this update – if you’d like to talk about that. We added the LFG tool because we wanted players to have a way to customize their grouping options. Not everyone wants to be in a big guild, not everyone wants to run the same content, and not everyone wants to instance match (shocking, I know). LFG will let people put together groups on their own terms. As for other “PC features,” it’d be wild speculation. So other tools like, renaming a pet, having a game server clock, Last Logged In information from the Guild System, Special Emotes, Wardrobe System, and so on and so forth. Do you think we’ll see those in TERA Console any time soon? Soon is a subjective term. Some of these, yeah. Others? Not so sure. The biggest complaint we saw from players was the lack of content. Whenever new content came, so did the players. If there wasn’t MORE to do, however, they left. I think players will see a very different experience as they play through Deathwrack and that the game is moving in a different direction. A couple more questions, I promise. Elite Status has gold boosts. That’s a great way. Doing your daily vanguards is a good avenue for gold. Play the broker. Participate in events! Leveling events usually drop decent chunks of gold into players’ wallets. Two questions from Richard Green! This comes down to managing the economy and progress rates. Permanent adjustments aren’t something we’ll do lightly. One more question from Serdar, who seems to be your biggest fan. Why, oh why don’t you like Tuna Pizza Halrath? Because I have a soul? Thank you Halrath for this interview, I’m a big fan of TERA, been loving the console version – even though most people ask me why. I have no idea how to answer them. Thank you for your time. Thank you very much, Sarumonin! We appreciate your energy, support, and participation! Oh, one last thing actually. 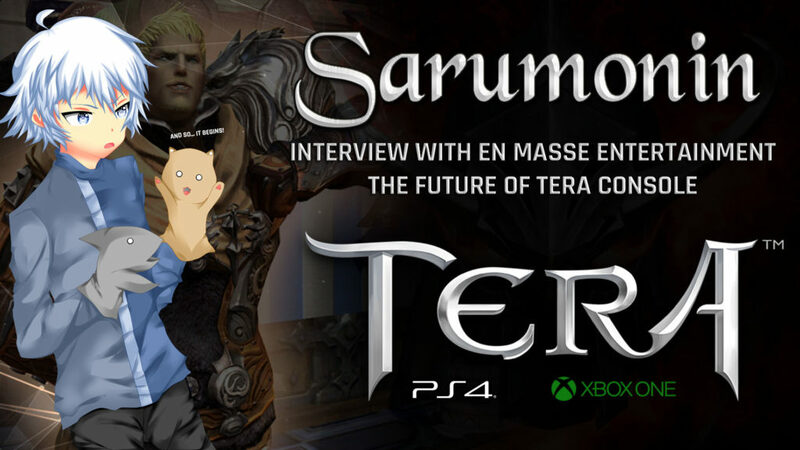 I see that En Masse is going ahead is taking part of helping with the Japanese Playstation version of TERA. What does that mean? Will we be seeing Japanese crossovers with TERA NA and EU – such as Hello Kitty, Attack on Titan, and perhaps other things? Launching TERA on PlayStation in Japan is basically adding another region and language. So, PSNA, PSEU, and now (or, soon!) PSJP. They’ll run the same version and have the same content. As for crossovers, yeah. That’s on my list. I wrote the Attack on Titan crossover proposal and I’m keen to get some of that gear on my PlayStation castanic army. Is there anything you’d like to tell the TERA Console community about the upcoming update, or whatever the case? Tell your friends. Spread the word. And thank you all for playing!